Supercharger's manager/agent architecture installs in minutes and displays your global WEC environment on a single pane of glass. Check the status of event forwarding from your browser or even your phone. Create/edit/delete subscriptions with a click. Pre-built managed filters leverage our deep knowledge of the Windows Security Log. Point and click to create Xpath queries that collect the events you want while leaving the noise behind. New to Windows Event Collection? Who's sending events and who isn't? Why? Supercharger Enterprise expands on this foundation, providing comprehensive enterprise management of your global Windows Event Collection environment. 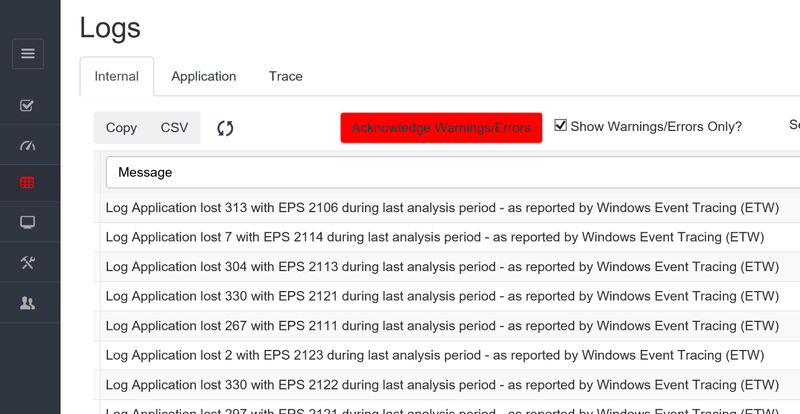 Supercharger monitors every aspect of collector health alerting you via color-coded dashboard, events sent to your SIEM and optionally email to any issue affecting event log collection. Supercharger detects if and when WEC becomes overloaded and begins to drop events which could result in lost audit trails or allow intrusions to go undetected. Supercharger monitors the status of every source computer for every subscription in your environment. Supercharger queries Active Directory for membership of each group assigned to a subscription and compares these computer accounts to the source computers reported by WEC. After filtering out non-existant, dormant or disabled accounts Supercharger shows you which endpoints are sending events and which ones are missing. If percentage of healthy forwarders falls below your specified threshold the subscription goes red and you are alerted. Out of the box, a Windows Server is not optimized for dedicated Windows Event Collection and above only 2,500 events per second (EPS) we start to see stability issues and dropped events. Supercharger can automatically optimize WSMan settings, event logging buffers, the TCP/IP stack and HTTP.SYS settings to increase EPS by multiple factors while almost eliminating WEC instability issues and dropped events which can compromise instrusion detection, compliance and audit controls. In our tests we are able to sustain 30,000 events per second. What if you have tens of thousands of workstations or hundreds of servers that simply produce more events than one Collector can keep up with? Supercharger Enterprise can automatically distribute and balance this load across multiple controllers with Load Balanced Subscriptions. One of the most powerful features of Windows Event Collection is its ability to define advanced filters that define exactly which events you want to forward – and those that are just “noise” and should be left behind. But building these filters requires specialized knowledge of XML query syntax and of the event logs you are collecting. Supercharger helps you build powerful filters whether you know XML query and we provide special help for the Security Log thanks to our relationship with UltimateItSecurity.com. Managed filters are where you find these capabilities. Once you build your filter you can assign it to multiple subscriptions without duplicating it. To simplify configuration of downstream configuration and for optimal performance you should maintain a one-to-one mapping between log types and destination logs on collectors. This requires creation of additional custom event logs which is a technical and laborious process. Supercharger provides one-click custom log creation. Event sources records build up indefinitely in the registry which in high-turnover environments become substantial. WEC never deletes old sources. Supercharger can purge old event sources after a user defined interval. Collector Policies enforce centralized configuration control and can automatically optimize collectors for throughput and dependability. Subscription Policies ensure subscriptions are configured consistently across your entire environment and allow you to manage similar subscriptions the same way without duplicating settings. Role based access control using Active Directory. Spot unusual activity levels. Supercharger surfaces key performance counters to the dashboard with visualizations that plot current activity against 7-day peak and average. Supercharger’s Manager/Agent architecture is built around around WEC subscriptions and the Windows servers (aka Collectors) that host them. Other Supercharger objects include Collector Policies, Subscription Policies and Managed Filters. Subscription Policies are like Collector Policies but at the Subscription level. Both Supercharger and WEC have a number of settings on Subscriptions that determine how the subscription works in WEC and how Supercharger handles it as well. You can configure these settings as a Subscription Policy and assign that policy to each subscription across your environment that needs to be configured the same way. Managed Filters One of the most powerful features of Windows Event Collection is its ability to define advanced filters that define exactly which events you want to forward – and those that are just “noise” and should be left behind. But building these filters requires specialized knowledge of XML query syntax and of the event logs you are collectoing. Supercharger helps you build powerful filters whether you know XML query and we provide special help for the Security Log thanks to our relationship with UltimateItSecurity.com. Managed filters are where you find these capabilities. Once you build your filter you can assign it to multiple subscriptions without duplicating it. Supercharger's Manager/Agent architecture allows to install and manage your entire Windows Event Collection environment within minutes. One Supercharger Manager can handle many Windows Event Collectors. Then add the Supercharger Agent to each collector. Voila!